Spectra competitor Kinder Morgan is trying to fly under residents’ radar to gouge its hundred-foot Tennessee Gas Pipeline (TGP) right of way through Massachusetts. This is another $3 billion boondoggle that, like Spectra’ Sabal Trail pipeline through the southeast, could easily be replaced by solar power and conservation, which would keep LNG export from running up the price of existing methane gas supplies. Kinder Morgan is proposing to build a large, high pressure natural gas pipeline through 45 towns in Massachusetts, including Groton. 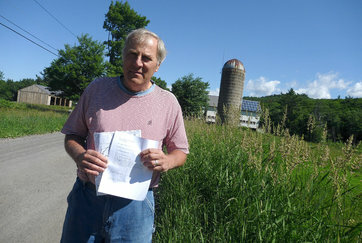 More than five month ago, agents of this company entered the town of Groton and began requesting that affected residents sign survey permission forms. They did not disclose the true scope of the pipeline project or that your participation in it might be anything but completely voluntary — since they plan to use eminent domain to take easements from property owners as necessary. When concerned residents called Groton town officials for an explanation, they were met with silence — the officials had not been informed of any such project. When Kinder Morgan tried this same tactic recently in Andover, they were told to cease-and-desist until such time that Kinder Morgan representatives had presented their plans at a public town meeting. He wants to know why KM is hiding its pipeline in the dark. The answer is simple. Sunlight is a natural disinfectant — and letting sunlight in exposes all the warts and shortcomings of everything that it touches. Kinder Morgan likes the dark. They would very much prefer that the public not know the details of their pipeline plans. They don’t want you questioning the wisdom of their preferred pipeline route and they certainly don’t want you questioning whether we in fact need this huge new pipeline at all. These affected towns, along with others further to the west, are our allies in the fight to shift this pipeline into less damaging, pre-existing pathways. Careful what you wish for. Pre-existing corridors means taking still more land from landowners who already have pipelines. That’s what sparked the landowner countersuit in Leesburg, GA that looks likely to haul pipeline company Spectra Energy back to Lee County, Georgia for a jury trial on trespass about its proposed Sabal Trail Transmission pipeline. Shifting onto pre-existing paths just makes it worse for somebody else. Better would be no pipeline at all. Oh, and does this part sound familiar? …this line represents the center of a “study corridor” that may be around 600 feet wide, which will be narrowed down to a 100-foot “construction corridor” located up to 300 feet on either side of the line. Just like Sabal Trail’s useless gouge, that sounds more like a pipeline path to the sea for export than for local use. How long until Excelerate files for LNG export from Massachusetts Bay? I am personally aware that some of the concerns about the project involve impact to natural resources and sensitive environmental resources to both state-owned and other publicly and privately owned lands. Our environmental agencies are starting to examine available information about these potential routes and I fully expect that any process will need to include detailed environmental reviews. How about we get the environmental agencies in Alabama, Georgia, and Florida involved in reviewing Sabal Trail’s destructive march to the sea? The proposed pipeline would intersect numerous private properties, multiple aquifers, protected wetlands, wildlife habitat and so much more. Added to the region’s existing market for natural gas as a heating fuel, new demand for gas by electricity generators has created wintertime shortfalls and price spikes beyond previous experience — a situation that officials are eager to address. New England’s governors have gone so far as to propose a tariff on electricity users to cover the cost of building new pipeline capacity. But Mr. Jaworski, along with a growing number of critics of pipeline expansion in general, remains unmoved, arguing that there are less costly and intrusive ways to address the region’s energy needs. It should be noted, however, the ultimate destination of the gas is the purview of NED Project customers that subscribe to project capacity. Translation: that hundred-foot gouge KM wants through your back yard could be to sell methane to China or Ukraine. The NYTimes story (and much less KM’s own page) never mentions that Sabal Trail’s similar pipeline through southeast states would take twice the acreage to produce the same amount of power as solar panels. Sure, Mass. gets less sunlight than Georgia. 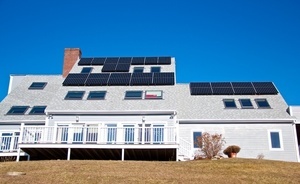 But here are solar panels on a house in Stowe, Mass. No FERC permit required, four months from contract to power on, no dirty pipeline for fuel, and no CO2 or methane emissions. No fracked gas in Mass. or anywhere else. Go solar!